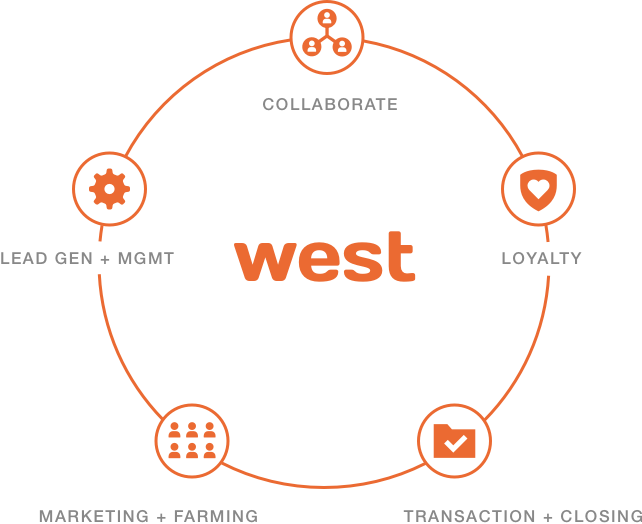 WEST is creating an exciting ecosystem of products and services that the Realtors use on a regular basis. More importantly, we are creating a shared data layer to help those applications work better together. We refer to this as “the plumbing” between best in show solutions. Nudge is the easiest way to make awesome digital flyers and present complex market data to your consumers. Updater lets consumers organize and compete all their moving related tasks from one single dashboard saving countless hours. Skip the calendars and fridge magnets. Keep sends your clients quarterly financial updates on their biggest investment so they never forget you. Multiple user Ids, forgetting your passwords. All things of the past. We’re creating a single-sign-on (SSO) environment that will connect all of your WEST tools and partners into one hub. We are building apps that fit your entire workflow from pre closing, through closing and into post closing. We have chosen our products specifically to fit your needs and our goal is to create client cycles that increase your business. No more creaky, old software that looks like it fell out of the 90’s. Our products and partners are modern, open and nimble. We are not victims of antiquated code. We expect everything we provide our partners to be products we’d use ourselves.